Managing the Crisis is a two book publication and is the result of a study conducted by the FDIC. They examine the challenges faced by the FDIC and RTC in resolving troubled banks and thrifts during the financial crisis of the 1980s and early 1990s. 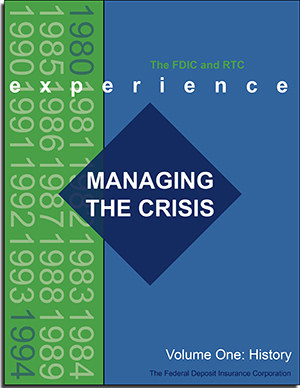 Managing the Crisis: The FDIC and RTC Experience examines the challenges faced by the FDIC and the RTC in resolving troubled banks and thrifts during the financial crisis of the 1980s and early 1990s. This study reviews the resolution and asset disposition strategies developed and implemented by the FDIC and the RTC in response to the crisis and describes the evolution of the methods used. It also reflects on the effectiveness of these methods, as well as the lessons learned. This study does not discuss the reasons for the upsurge in the number of bank and thrift failures during this period, nor does it explore how the crisis could have been prevented. Those issues are addressed in History of the Eighties?Lessons for the Future: An Examination of the Banking Crises of the 1980s and Early 1990s, a study that was complied and published by the FDIC in December 1997. 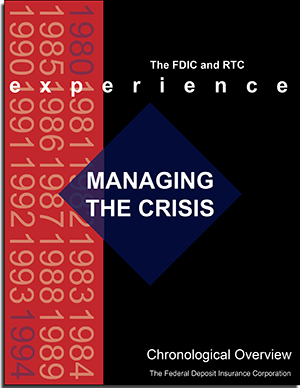 The FDIC hosted a 1?-day symposium on April 29 & 30, 1998 to examine the FDIC and the RTC experience in resolving troubled banks and thrifts during the financial crisis years of 1980?1994. This symposium, ?Managing the Crisis: The FDIC and RTC Experience,? featured current and former FDIC and RTC executives, executives from the bank and thrift industries, officials from other regulatory agencies, private sector professionals and scholars who discussed the strategies used by the FDIC and the RTC to resolve and liquidate the 1,617 banks and 1,295 thrifts that failed during this time period. The Chronological Overview describes U.S. economic and banking conditions, resolution activity, and significant FDIC/RTC milestones during the financial crisis. If you are unable to use Portable Document Format (PDF) or for other reasons would like this FDIC publication in print rather than electronic format, you can request a document in hard copy.